This year my almost 2 year old is going to be Raggedy Ann for Halloween. I had no idea though about how to make a wig and everyone I knew who did know how to crochet or knit were either busy or couldn’t find a pattern they could do without help so I went searching on Etsy for a wig for my daughter. If you search on Etsy for Raggedy Ann wigs you get 102 results but when I came across the one I eventually got I knew right away it was the one for us, well actually I had a hard time choosing between the two that the one particular vendor had in their shop but I had an easy time narrowing it down to that one shop. The shop that I found was Yumbaby and the wig I narrowed it down to was their Raggedy Ann wig. 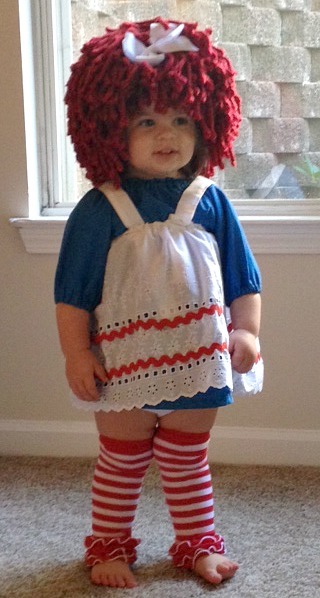 The cutest Raggedy Ann there has ever been! The wig is very easy to put on. In the picture above you can see some of my daughter’s hair but she was being skwirmy. I had about a 1-2 minute window to get the wig on and take a good picture, so I was more worried about that then getting all of her hair in the wig but it would have been pretty simple to do especially if I had started with putting her hair into a few pigtails. The way the wig is made there is a loop on the inside that is tight around the child’s head so it will stay on and that makes it easier to hide hair in. Another great thing about this wig is that the yarn used to make it is very soft. I could also tell by looking and feeling the wig that it is very well made and I have no worries of it ever falling apart which is good news because now I can add it to dress ups and any future costumes I might need this for. The wigs do come in different sizes, this particular wig ranging from 0 months all the way up to XL adult. I got the 2t for my daughter after following their sizing chart and it fits perfectly. The bow that is used is also very cute! Fits perfectly with the Raggedy Ann theme. Another picture of my daughter just because I love her in her costume and this cute new wig! Do you need a wig for this Halloween? Yumbaby has a ready to ship section in their shop for wigs that can be shipped right away and will get to you just in time for Halloween so don’t miss out on getting a well made, soft and cute wig for your child or even yourself! They don’t just have Raggedy Ann wigs they have lot’s of different wigs, even ones with beards! So head over to their shop and check out what they have available, you won’t be disappointed. Also check out our how to make your own DIY Disney Frozen Elsa Wig! Lol so adorable! 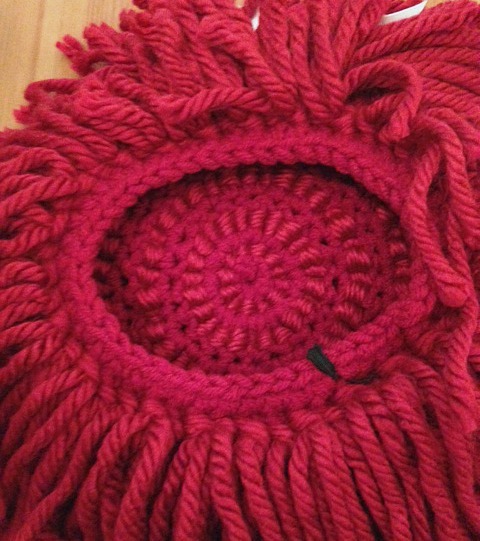 It reminds me of the Raggedy Anne costume I wore for a couple years as a kid! This is super cute. When I was little my brother and I were dressed as Raggedy Ann and Andy. Back then a lot of our costumes were home made. My mom use a mop head and dyed them red. It actually turned out pretty cute. 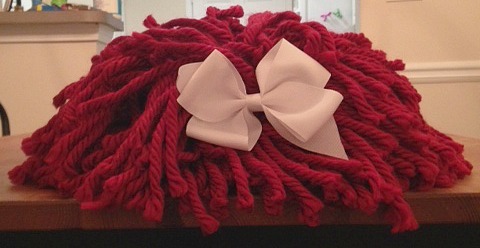 What a great job on that Raggedy Ann wig! It fits perfectly and is so adorable! This is such a cute Raggedy Ann wig and would be a great wig to wear on Halloween and go as Raggedy Ann. 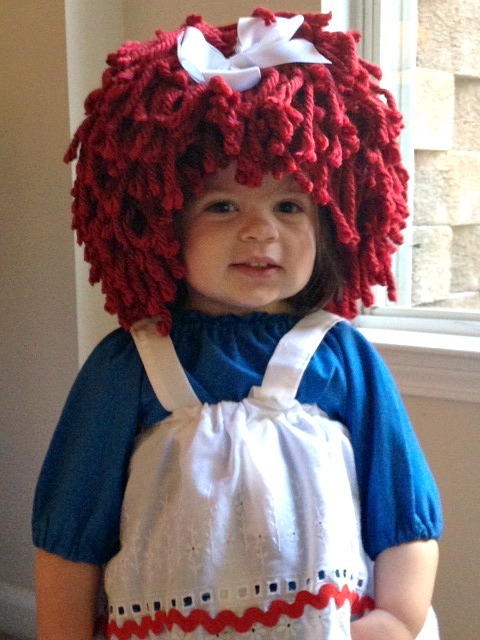 I think my niece would look great as Raggedy Ann. Your daughter looks so adorable in her costume!! That is so adorable and something she can play with for a long time!